What film buff hasn't dreamt of standing on the steps of Palermo's Opera House re-living the moment in Godfather III when Don Michael Corleone saw his daughter shot dead. The Teatro Massimo (Palermo Opera House) is a magnificent building both inside and out, and symbolises the city of Palermo more than either the Cathedral or the Palace Chapel, both Monuments to the city's glorious past. Completed in 1897, it is located in Piazza Verdi and was designed by the Italian architect Giovanni Battista Filippo Basile to promote the image of the city following the unification of Italy in 1861. It is a magnificent building and the staging of the tragic climax of Godfather III on the steps of this very Sicilian edifice was a stroke of genius. See the film, go to Palermo, stand atop these steps and you can re-live the whole movie again from the braying of the donkey to the shot that rang out across the piazza. Palermo is one of Italy’s most exciting cities, vibrant, edgy, and seeming to carry a frisson of danger that may have more to do with its reputation as a former haven for the Mafia than its current status. Badly damaged in World War II, much of the centre was destroyed during the Allied invasion of Sicily in 1943. Crime soared in the subsequent chaos. Under Mussolini's crackdown on their activities many of the Mafia had fled to the USA and Canada, but the escape of inmates from prisons after the bombing raids put banditry back on the roads, a thriving black market grew up in the towns and villages, and the Mafia became a force again, reforming their clans and absorbing some of the new criminals. Many of the new official appointees also turned out to be Mafiosi, such as Calogero Vizzini and Giuseppe Genco Russo who presented themselves as political dissidents. Indeed their anti-communist positions had given them additional credibility. Mafia organizations entirely controlled the building sector in Palermo – as they did in the USA – and they were notorious for building shoddy edifices. They also had control of the quarries where aggregates were mined, most of the cement plants and the waste disposal: in fact, the entire construction industry. It was not until the Juges Falcone and Borsellino were murdered along with their wives, drivers, bodyguards and several passers-by in a roadside massacre in 1992 (an enormous explosion of bombs) that the people finally turned against them resulting in a massive government crackdown. Many defectors from the Mafia then came over to the side of the just but most of them paid a high price for their co-operation, often through the murder of their relatives. There is a magnificent monument to these two men who, despite opposition from the Government in Rome, not to mention local opposition, managed to undermine the power of the Mafia in Sicily: Unfortunately the Monument is situated on the road to the airport so it is not possible to stop by it to pay one's respects. There are two time-bombs ticking away in Sicily, the volcano Etna and the Mafia, both of which could explode at any time, although assurances are constantly given that both are under control. The Godfather film trilogy, although fiction, is a superb interpretation of the malign influence of the Cosa Nostra. The Godfather III, which Francis Ford Coppola described as an epilogue, not Part 3, shows how the Mafia moved into legitimate business. Michael Corleone (Al Pacino) now a pillar of church and society and reconciled to his wife and children, has moved away from his former Mafia associates. He has brought the family to Palermo to be present at his son Anthony's debut as an opera singer in Mascagni's Cavalleria Rusticana, a tale of murderous revenge in a Sicilian setting. Interweaved with the story is another about corruption in the Vatican and a thinly disguised reference to the murder of one of the Vatican's bankers who was found hanged under Blackfriars bridge in London. As the soaring music and emotional drama is acted out on stage, a real life drama is being acted out in the hidden corners and corridors of the Opera House where an assassin who has been hired to kill Michael Corleone, prowls the passageways with his henchmen, picking off Corleone's bodyguards who are hidden in alcoves and behind curtains, one by one. These are the scenes that crowd your mind as you tour the back stage of the Opera House. There are rooms that contain costumes from the many operas the theatre is famed for – especially Mozartian works which they seem to have made their own. The props room has some delightful pieces and I was especially taken with the head of a donkey which, although nothing to do with the Godfather, reminded me so much of the braying sound that nearly betrayed the killers on the steps of the Opera House. A wooden model theatre hardly prepares you for the ornate but beautiful interior of the theatre, red and gold and magnificent: it would have been complete if Cavalleria Rusticana had been playing as I surveyed the auditorium from the Royal Box. It was easy to visualize the Corleone family sitting there however, so brilliant was the cinematography and the filming that switched between the stage and the viewers in the boxes, whether it was Michael and daughter Mary, with Vincent, the cousin she loved hovering behind, or the revenge tale that was taking place in another one of the boxes as Don Altobello who has betrayed Michael, greedily scoffs his favourite cannoli provided by Connie, Michael’s sister, who gazes steadfastly at him through her opera glasses as the poison takes hold. The lush red velvet curtains that close off the boxes that hid the assassins and the bodyguards are as effective a cover as they were in the film. Wandering the passageway behind the boxes one half expected to bump into Mosca disguised as a priest and armed with his sniper rifle, prowling the stone-lined corridors. Was this where he had eliminated three of Michael’s bodyguards, or was it behind this curtain that one of his own men was murdered? Once outside on the famous steps of the Teatro Massimo, the horrific final scene of this American/Sicilian tragedy can be re-played in the mind as Mosca’s bullets find and wound Michael and kill his beloved daughter. Like all great tragedies, Michael' punishment was more terrible than he could ever have imagined. His screams still reverberate in my head but then so does the explosion on the lake as he sat in his study while Fredo, his brother, was killed on his instructions. The Mafia shows no mercy. 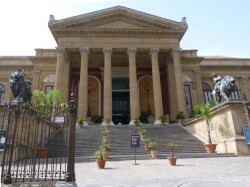 The Teatro Massimo is only one of Palermo’s many glorious buildings to visit. Just wandering is a delight as family life is lived very much in the streets of Palermo. There are markets, one open until late in the evening, there are palaces, churches, a cathedral, the port, and exterior architecture to admire, and then – the ice cream. I’ve never eaten better! 9.30am - 6pm (last tour at 5.30pm, when a performance is scheduled at 4pm last visit at 3pm, while with a 5.30pm performance last visit at 4pm). Tour last 30 minutes. Fascinating feature and brilliant pictures, would make anyone want to go there and feel it all. Definitely a must for fans - especially if you sign up for one of the anti-Mafia tours with Addiopizzo (not available through the tour agencies, contact them online). More to follow on this remarkable group. This looks fascinating - I used to think Godfather was a work of fiction but there lies the truth and realities of mafias and dons which existed in reality. The Palermo looks an exciting place for fans and tourists alike.